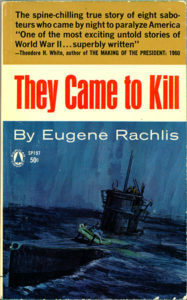 “THEY CAME To KILL” By Eugene Rachlis. The spine-chilling true story of eight German saboteurs who came by night to paralyze America. Making a top-secret voyage from Germany aboard the submarine U-202, the enemy agents slipped ashore at Long Island, New York., on June 13, 1942. Silently, the men buried their cache of fuses and bombs in the sand. Dressed as U.S. civilians they set out toward the nearest American city. 1962 Paperback edition, 240 pages, no photos, maps or index.. A very difficult book to find.